Bright pink kitsch Hello Kitty themed badge. This fun 25mm classic Hello Kitty Badge has the word Meow under the iconic white Hello Kitty illustration. 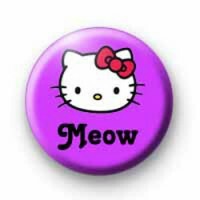 This is a cute badge for Hello Kitty themed events, parties or just for those fans of this adorable cat.